Bella and Edward. . Wallpaper and background images in the Edward e Bella club tagged: edward cullen bella swan kristen stewart robert pattinson. 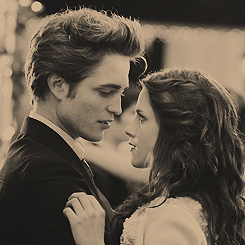 This Edward e Bella photo contains concerto. There might also be completo, vestito di affari, bouquet, corpetto, posy, mazzo di fiori, corsage, nosegay, ritratto, headshot, primo piano, and closeup.